My name is Dina and I’m a newborn baby photographer in Brooklyn New York. 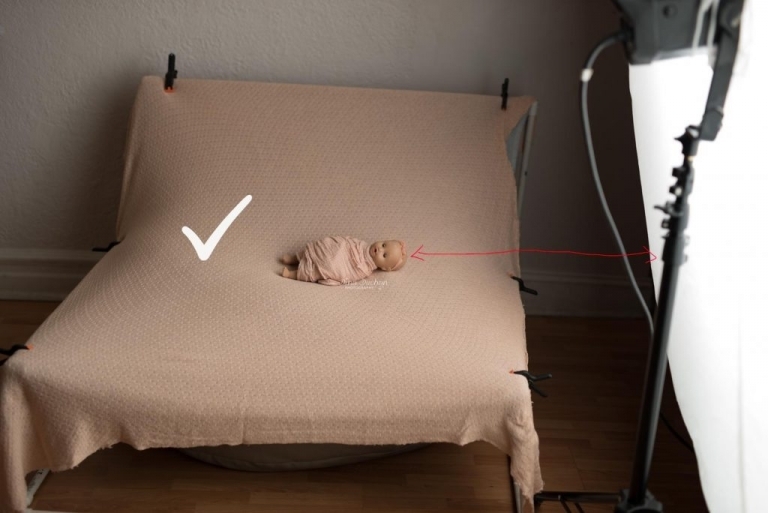 Today I want to show you how to use your studio lighting correctly when shooting newborn babies. Our goal is to have beautiful soft lighting, with soft – form defining shadows. You don’t want harsh lighting or harsh/strong edged shadows – but you also don’t want completely flat light without any shadows. – Light: I have a Bowens flash set – not that I recommend this unit in particular. I do recommend a flash unit with multiple power settings. Your flash needs to be set on low power so you can shoot at wide open aperture without blowing out your images and making them completely white. In order to fire the flash I have a Bowens trigger that goes on my camera’s ‘hot shoe’. –Light Modifier: I’m using the very large 86″ PLM system. It is a very large umbrella with a white fabric diffuser over it to soften the light. My PLM has soft silver bounce interior and black exterior. Essentially it is a sort of a big soft box. I bought the largest light modifier because the larger the beam of the light source, the softer the lighting on your subject becomes. With newborn babies softer is better! Tip* If you are on the lowest power and the light still seems too strong, put two fabric diffusers on your umbrella to diffuse your light further more. -Lens: Sigma art 50mm 1.4 This lens opens w i d e and helps me get that creamy background look. We’ll start with the correct way of using studio lighting. Later I’ll show you other ways to use lighting – some of which are less flattering to your subjects. Shutter Speed is 125, which is the correct sync speed for my flash. Check your camera/flash manual to determine which is your correct sync speed. My ISO is very low >100. My white balance is set with custom WB with the expodisc. My flash power is at its lowest setting to accommodate the wide aperture that I use. What can we do if the light is too powerful? I want to address an issue that many photographers have when the light is too powerful. We love shooting with wide apertures, we want to get the blurred backdrop and get that creamy smooth look. but if the light power is at it’s lowest setting and the images are still getting blown out? 1) Get diffusion fabrics. If you are using the PLM system, buy more than one diffusion fabric. If you have other modifiers get a simple sheer white fabric and clip it to your soft box. 2) Get a neutral density filter for your lens. Or as they are called ND filters. 3) Get a neutral density filter to put on your light! but be carful with this ND Filter you can’t use your modeling light or else you will burn the filter. Let me explain why I think this is the ideal lighting. The doll is lit from right to left with soft looking overall lighting. There are no harsh highlights or ‘hot spots’ on her face. The shadows are soft and gradual (no hard edge shadows). Correct highlights or shadows are what makes the image work! Shadows are good and beautiful when in the right place! This is why I don’t use a reflector. I don’t want to fill in the good looking shadows I’m working hard to create. In this image I placed the light 90° parallel to the right side. I also make sure that the edge of the light doesn’t get past baby’s head (or doll in our case). For me, a 90° light setup very much resembles a light pouring in through an outside window. I place the light modifier just to the edge of head as you see in this example: All images shown here are SOOC (straight out of camera). and this one as well. Note that the backdrop is not completely illuminated. The light gets feathered. What an interesting term, “feathered”! I imagine the edge of the light is lightly brushes my shooting subject, not hitting it hard in any way. Feathered lighting is the goal. It’s soft, and oh, so beautiful. Look how lovely the doll is lit here; I see some yummy shadows and some soft highlights. I also see the background/ backdrop is not washed out with light. I don’t want the background/ backdrop to be too illuminated and take the attention away from my subject! Now let’s see how the doll looks in an upright sitting position. Notice how nicely the light wraps its face and body. The catch light is in the correct place – the subject’s eyes, drawing your attention to them. And just the right amount of shadows add a soft form-defining 3D like look. Look at the end result – the light appears as if it’s coming from behind the baby, causing a strong highlight on the head and ‘hole shadows’ on the face. This is a common error, resulting in the face of the baby appearing dark, while its body is brighter, as shown below. Here is the same result with the subject sitting in an upright position – again very strong highlights and a dark face. 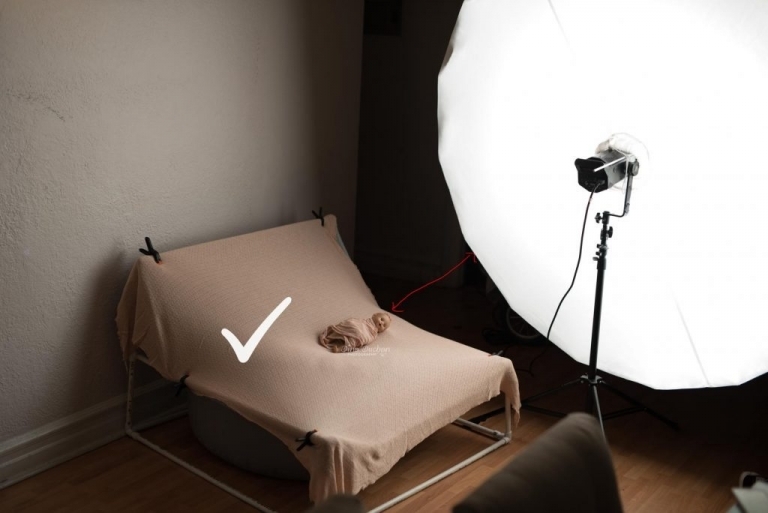 The last setup I want to show is not necessarily wrong, I just want you to be aware of the very slight difference, because once you will pay attention to it you will definitely be able to achieve the dreamy lighting you desire for newborn babies. This one is the 45° lighting. As you see the light is directed at the subject; Hitting it directly will cause harsher highlights and harsher shadows. Also the background / backdrop will be lit as well, Something I like to avoid. Here it is from the side. The whole background is lit with directional lighting, unlike the feathered lighting I love so much. Now let’s look at a closeup; notice that the wrap is brighter from directional lighting and the background is lighter. At this point we can compare. Which shot looks better to you? In the one on left the light is feathered and doesn’t hit the doll directly. As a result, the light appears softer – and on the other hand, the highlights are slightly harsher. So there is more ‘white’ on the fabric and more ‘spill’ of light on the backdrop. This is not technically wrong; it is just my artistic preference. So when do I use 45° lighting? If baby is posed in a way that his chin is tucked in and I notice that there is not enough light from the 90° lighting, I will turn the light 45° to fill the subject in with more light. If you think to yourself, well I like that there is more light just like in the the right image. I want to point out that these images are SOOC. Naturally the feathered Lighting will be slightly darker SOOC. However when I add exposure later in post processing, it will add it without changing the quality of light! Here are all three setups in the sitting position: Notice how much softer the shadows on the feathered light looks! Last, but not least – if you shoot from the opposite direction of your light, you will get the yummiest backlight type of image. This lighting is best for detailed shots such as macro or close ups! And I want to finish up with the lighting doll image I prefer best – the 90° feathered look. This time edited! 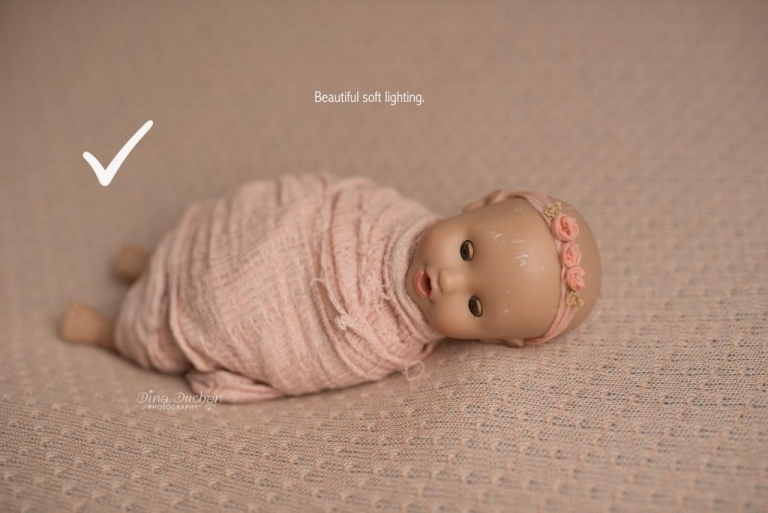 I hope you enjoyed this article on how to use newborn lighting correctly and achieve the dreamiest look! Please let me know if you have any questions in the comments and I’ll be happy to post my response.